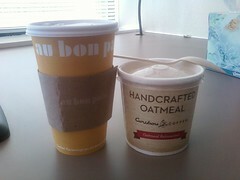 I'm still trying to recover from last night's dinner at Le Chat Noir (review coming soon), so for today's breakfast, I opted for a cup of cafe roast and Caribou Coffee's handcrafted oatmeal, "maple brown sugar crunch." This oatmeal is my favorite. I think that since we're doing restaurant week three nights in a row, a light breakfast and lunch would suffice. I'm looking forward to tonight's dinner at Marrakesh Palace Pasha Lounge, and I'm glad it's Friday. I don't have time to eat breakfast, but if I have I'd love a bagel with schmear and coffee every single day. i always ask alex about what he would say when my mom comes here who also prefers bread over rice for breakfast. he said it will be different. he'd do his best to keep quiet.. haha..
How I wish I can have breakfast everyday but since I wake up late, there's no time for breakfast at home. i usually have pandesal or any other bread for breakfast.